You are here: Home / Blog / News / Investment Platform Coming Soon! 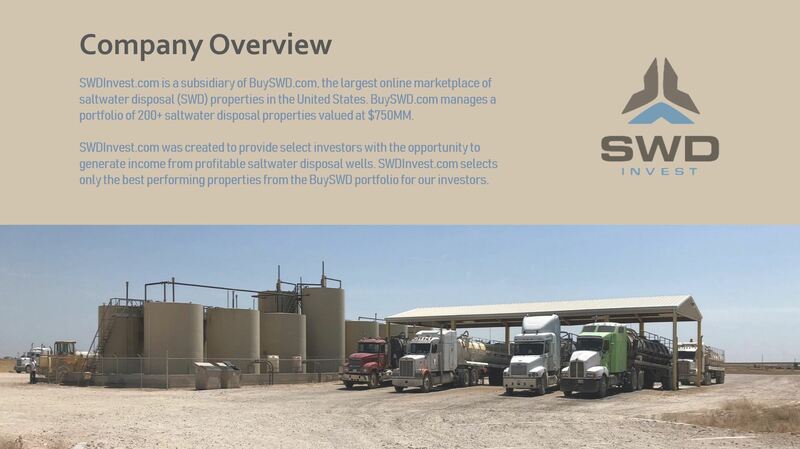 BuySWD.com is creating a new investment platform to provide qualified investors with the opportunity to purchase fractional interest in profitable saltwater disposal properties. The new platform will “cherry-pick” high quality assets from the BuySWD.com inventory. Select SWD’s must meet strict investment criteria before being accepted into the SWDInvest.com portfolio. The first property we will be opening up for participation is located in the Permian basin of West Texas. The property is being purchased for $6MM and is generating $140K in monthly cash flow. 1% positions will be sold for $86K and will generate immediate income of $1,600 per month per 1% ownership. Only 70 units are available and positions will be sold on a first come first serve basis. Contact kurt@buyswd.com for more information and to reserve your spot today.